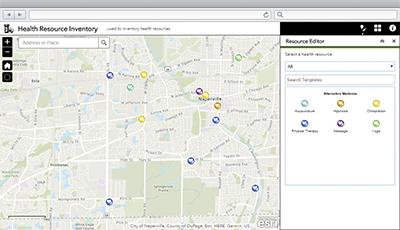 Health Resource Inventory is a configuration of Web AppBuilder for ArcGIS that can be used by health and human services agencies to inventory homeless, drug treatment, and other service providers in a community. This inventory of health resources provides a foundation for several locator applications (for example, Homeless Service Locator, Opioid Treatment Locator, Drug Drop-off Locator) that can be used by the general public to locate health and human services. To deploy Health Resource Inventory with the ArcGIS Solutions Deployment Tool requires specific software. To manually deploy Health Resource Inventory in your organization requires specific software. Application Health Resource Inventory An application used by public health agencies to inventory homeless, drug treatment, and other health and human service providers in a community. Map Health Resource Inventory A map used in the Health Resource Inventory application to inventory homeless, drug treatment, and other health and human service providers in a community. Feature layers HealthFacilities A feature layer used to store drug treatment, mental health, homelessness, and other health and human services facilities. MedicalFacilities A feature layer used to store hospitals, clinics, and other medical facilities. PrescriptionDrugLocations A feature layer used to store naloxone distribution centers and prescription drug drop-off locations with recorded weights of unused drugs turned in. Below are the release dates and notes for Health Resource Inventory.